It’s that time of year again! Delicious strawberry season! One of my favorite things to do is pick strawberries. Finding delicious berries, sneaking bites in the field. Good times. This was the first year that Zachary got to pick with us! Last year, he was just a wee one and stayed with Grandma. I am glad that we went on the weekend when Stephen was home. There was no way I could have handled both kids and got any amount of strawberries to bring home. Zachary was eating strawberries out of the box and half way down the field most of the time! The kid is insane! By the time we were finished picking, we all needed to change clothes. Zachary had slimed us all! I had strawberry juice on my shorts and shirt. He was covered in strawberry goodness. It was kind of funny. He didn’t so much picking but he did a lot of eating. They should have weighed him before and after we were in the field so they could charge us for what he ate. This was the first year we went to Theis Farms and it was great. The morning was a little chilly but that’s ok. The crowds weren’t that large so it made it more pleasant. I never pick enough berries. There are so many things I want to make, let alone eat them plain. I might still have to take a trip to Lakeview Farms later. I think I will either need the “leash” or the stroller if I venture out alone with the kids during the week. Emily’s preschool has a tradition of having a parade and picnic on the last day of school. This year, due to making up snow days, it wasn’t actually on the last day of school. Unfortunately, it rained. All morning long. They had to move the parade and picnic inside. The kids were pretty good sports about it though. They had made special shirts and hats just for the occasion. The original plan was to march around the front drive of school. The kids were going to play instruments and the teachers were going to throw candy. They we would have a picnic on the grassy area next to the building. Needless to say, everyone had to improvise. The kids marched through the sanctuary several times, making music. They were still very excited even though they had to be indoors. After the parade, we moved into the fellowship hall and sat on blankets and had lunch. Despite being in cramped quarters, everyone had a great time. It was a lot of fun being able to talk with the teachers and other parents. It’s hard to believe that Emily’s first year of preschool is almost over. Two more classes and that’s it! The weather around my birthday is either pretty chilly or hot. This year was unpredictable. They had been calling for rain all week and it had been spotty at best. I was hesitant to plan anything outdoors in case it was wet. I wanted to have a plan though so I scheduled myself a massage. Stephen very generously gave me a gift certificate for a deep tissue massage for Mother’s Day so I thought my birthday was the best time to enjoy it. It was DIVINE! One hour is never enough. I could lay on the table all day long, I was so relaxed. The rain came in the afternoon. And it poured! I was a little sad as it ruined our BBQ plans but we quickly came up with other ideas. Later in the evening, my mother-in-law, sister-in-law and her boyfriend came over for cake. Yummy goodness. I absolutely LOVE J. Noto. He can seriously make just about anything you can dream up. My dream involved chocolate and marshmallow. He created a fabulous cake for my birthday. It was a super moist devils food cake with marshmallow filing. It was covered in a chocolate ganache shell and decorated with creamy ganache and chocolate pieces. It was so very rich and delicious. I know I just spent a paragraph talking about a cake but if you had tasted it you would understand why. I was very blessed that my husband was able to take the day off and spend it with me and the kids. We had a really great day together. I was totally spoiled by all of the gifts and attention. A girl could get used to that you know! Not having to change diapers and do the dishes? That would have been enough for me. But Stephen really topped himself this year. My favorite gift by far is my new Coach purse. I have never owned one. I had never even wanted one. I am/was in the camp of quantity over quality but he finally wore me down. I always told him no. I am in love. With my husband. My kids and my purse. Seriously though, I have the best family in the world. I am truly blessed. It was a wonderful day. Turning 33 really wasn’t that bad. If I could have cake from J.Noto each time, I’d do it more often. 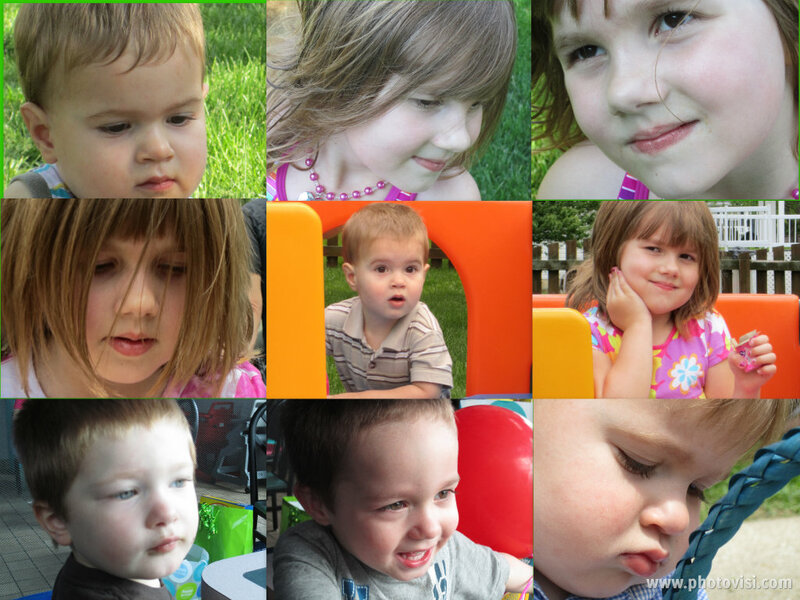 One year ago, my friend Sam lost her son due to SIDS. Her loss really hit close to home as Mason and Will were only three months younger than Zachary. Sam and I had been comparing notes on eating, sleeping and reflux issues. My heart broke for Sam and her family when I heard the news of their unexpected loss. I don’t know how anyone handles the loss of a child. It’s just not right. There are no words to describe the horror that I am sure Sam and her family go through on a daily basis. My prayer for them is that the pain diminishes. That every morning isn’t filled with sorrow. Mason will always live on in their memories. I can’t tell you why he was taken from them. I don’t understand why God would take a child from his family so young when they are full of life and love. Why the parents hopes and dreams for their children are lost. Why siblings will never know the joy of fighting with each other. These are things that we will never know. Sam and Rob set up a foundation in Mason’s memory, The Mason Werner Foundation.Their mission is to promote and raise awareness of SIDS. The main method is by providing informational onsies to new parents. Raise awareness of the back to sleep initiative. SIDS cannot be prevented but the risks can be reduced. That is one thing The Mason Werner Foundation hopes they can accomplish with their onsies. You can help! You can purchase a onsie for your child or as a shower gift or you can make a cash donation. They rely on donations to provide the onsies to new parents, childcare facilities and pediatric clinics. And if I go, while you’re still here…. My prayers and love go out to the Werner family, especially Saturday. Know that you are surrounded by love and that Mason will never be forgotten. End of the school year time. It still amazes me that Emily is just finishing up the end of her first year of preschool. Seems like I recall her just learning to walk, not going to preschool. That’s the thing with time. It just keeps moving no matter how much you want it to slow down. Emily and I decided to make a card that we saw in the May issue of Family Fun Magazine for her teachers. It even came with a nifty template to use, which I misplaced and refused to print off a new one. We were in the craft zone and I didn’t want to disrupt that! 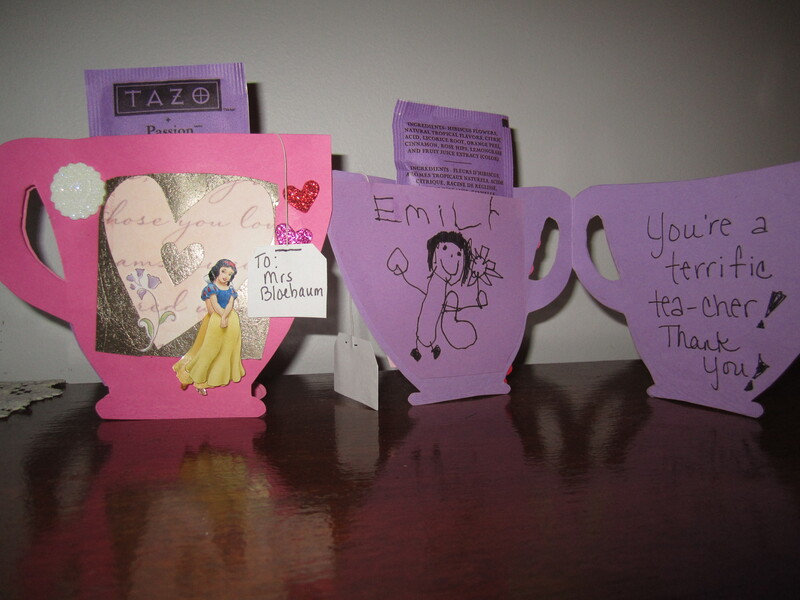 So I think my freehand tea cup turned out ok. Emily decorated the cups for the teachers and drew them a picture. I think they turned out really cute. Add one tea bag and a gift card and voila! End of the year teacher gift! Her teachers RAVED about them. Super easy and good bonding time for the two of us. Thanks to my friend’s blog, I have become obsessed with bows, barrettes, headbands and flowers. It all started with a random post from her about cupcakes in a jar. That’s another one I have to try. It got me perusing her blog and I came across this headband that she made. Super cute! And it looked like something that I could actually do. And then I came across the blog Craft Snob. Again, more tutorials on crafty stuff to make. Because I don’t have enough stuff to do, I need to add more hobbies. I absolutely loved some of her fabric flowers and thought, again, hey, I can do this. So I rounded up my glue gun and a bunch of ribbon and went to town. I have to admit, not that you couldn’t tell, I am addicted. Making bows are actually therapeutic for me. The ones I have made have been super easy and pretty quick to make. I get some kind of a high when I see the finished product. I am sure my sister Heather is tired of me texting her pictures of my bows. Seen one, seen them all right? I am really having fun with these. Not sure what I will do with all of them, especially since I just bought a couple more things of ribbon and more glue sticks today. I foresee more bows in my future…. Mother’s Day. A day at one point I wasn’t sure that I would ever celebrate. And here I am. Celebrating with two of the best kids in the world. God must have thought I have done something right to let me raise these two little children. They are a true blessing. There are days, many days, where bedtime cannot come soon enough but every day is a gift. My children frustrate me, make me laugh, make me cry and cause me to pause. They cause me to see the world through their eyes. A world where things are new and unusual. They drive me crazy! Endless questions, the inability to go to the bathroom by myself…… All worth it at the end of the day. Seeing Emily and Zachary playing together makes my heart sing. Watching Zachary walk around the house with his hands behind his back, his numerous funny expressions. Makes me laugh. Listening to Emily sing, watching her dance. Brightens my day. 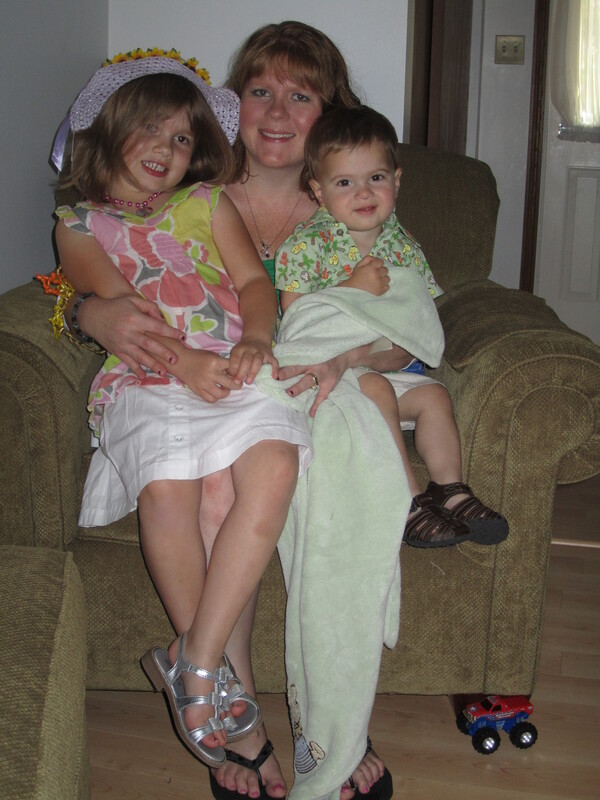 It is because of those two little souls that I celebrate Mother’s Day. I do not work outside of the home but I work very hard. Mother’s Day made me realize how much my husband and children appreciate me. A little bit anyway. I got many snuggles from my two, a yummy lunch and dinner and some amazing gifts. The funniest one being the Scooby Doo game that I really enjoy playing with Emily. Shhh!!! I let her win. But more than anything, I got to spend time with my family. And I didn’t have to do everything. Thank you Stephen! As much as I sometimes complain, as often as I fall asleep on the couch at the end of the day from exhaustion, as much as I want to cry some days, I am blessed. 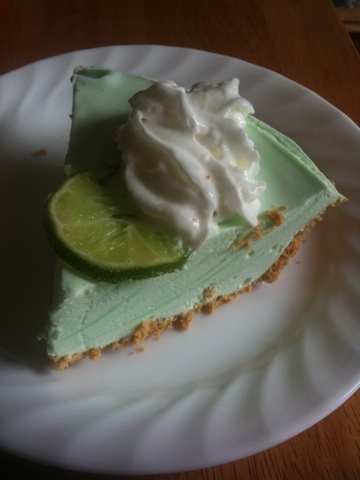 This recipe was so easy that Emily practically made the pie by herself. I helped with the boiling water part but she did the rest. It was super easy and not totally super bad for you. Without further ado- the recipe! 1) In a microwave-safe measuring cup hear water on high until boiling. Whisk in Jello until dissolved. 2) In a large bowl whisk together Jello mixture and yogurt. Fold in Cool Whip. Carefully spread in crust. Refrigerate at least 4 hours or until set. 3) Garnish as desired. Store in refrigerator. So yummy and so easy! Next, I am going to substitute strawberries in the recipe to make a strawberry pie. Love strawberry season! I have been playing around with my camera lately. Trying different settings, different lighting. I like how many of these have turned out. I really like taking some of the up close shots. Not posed per se. Just capturing the moment. I think I missed my calling. I really enjoy taking pictures. Maybe one day when the kids are grown, I’ll get a dslr and take a class. But for now, I will enjoy taking pictures with what I have- beautiful subjects. It’s not all about the equipment but how you use it. The end of April was full of birthday parties! Not only did we celebrate my nephew’s birthday but Emily also celebrated one of her best friend’s birthday! Happy 4th Birthday Slade!!!! Slade wanted to have his party at the bowling alley. Super cool! Stephen and I have been wanting to take Emily bowling, as we thought she would really enjoy it. Time. Just never made the time for it. So Slade having a party at the bowling alley was awesome! Luckily, Slade’s Mommy is an awesome lady! She picked Emily up so I didn’t have to worry about Zachary and dinner time. (Zachary is a bit of a beast around 5pm.) Emily had a blast accompanying Julie to pick up the cake and to pick up Chase and Slade from school. She was really intrigued by seeing where they went to school at. I eventually made my way out to the bowling alley after feeding the wee-beastie at home. When I got there, the kids were bowling and eating pizza. Emily was so surprised to see me. I guess she didn’t get the memo that I was coming later. It was so much fun to watch her bowl. The bowling alley is amazing. Not only is it non-smoking but it is super kid friendly. Bumpers and a ball ramp. Doesn’t get much better than that! Emily was crawling out of her skin when she got a spare. She was jumping up and down, screaming. It was really cute. I think all the kids had a great time! Thanks to Julie for picking up my crazy girl. I hope Slade had an amazing birthday!